Today we’ve published some new research that explores the tricky concept of community accountability. There’s a shorter summary here. Over the course of 2017, a team of researchers at the Institute for Voluntary Action Research carried out a qualitative study comprising 12 case studies of a range of community businesses, along with a review of relevant literature, to explore why community accountability matters, and what it looks like in practice. We had selfish as well as loftier reasons for looking at this subject. A better understanding of community accountability would help us, as funders, to make better decisions and to support good practice. More importantly, though, we know from talking to the businesses we have supported that community accountability really matters to them. They’ve described it to us as fundamental to how their business operates, and difficult to articulate to others. We wanted to address this complex area with some qualitative research that would take time to explore what accountability to the local community means for community businesses, why it matters and how they are tackling it. In short, it told us that community accountability matters hugely, but also that the words ‘community accountability’ don’t really resonate (everyone knew what the researchers were talking about, but they wouldn’t have called it that themselves). And it found out that operating in a manner that is accountable to the local community is core to how community businesses operate – it’s a value that they hold, and it’s how they work, rather than being an additional or adopted behaviour. Our findings suggest that ‘community accountability’ as a term is not yet widely used by community businesses. Within the study, businesses talked more about responsibility, engagement and being responsive to their communities. The research draws out a good point about necessary accountability (technical, legal, financial) which the businesses did not feel was sufficient accountability. For all of the organisations studied, accountability to the community went further than mere requirements. Business maturity mattered, too. Accountability shifted as businesses grew or developed, with elements formalising as and when needed. Accountability shifts and changes across the lifetime of a business, which will use different ways of drawing in different groups at different times and for different needs. But the importance of informal accountability came through strongly, instead of (if in the early stages) or alongside formal approaches. There are, of course, legal, financial or regulatory accountabilities for community businesses, depending on their legal form – be that company limited by guarantee, charity, CIC, CBS, or other form. Each of these forms brings specific governance requirements. Earlier studies have nicely drawn out the different ‘modes’ of accountability: holding to account, giving an account and taking into account (see: Leat, D. (1988) Voluntary organisations and accountability, London: NCVO). 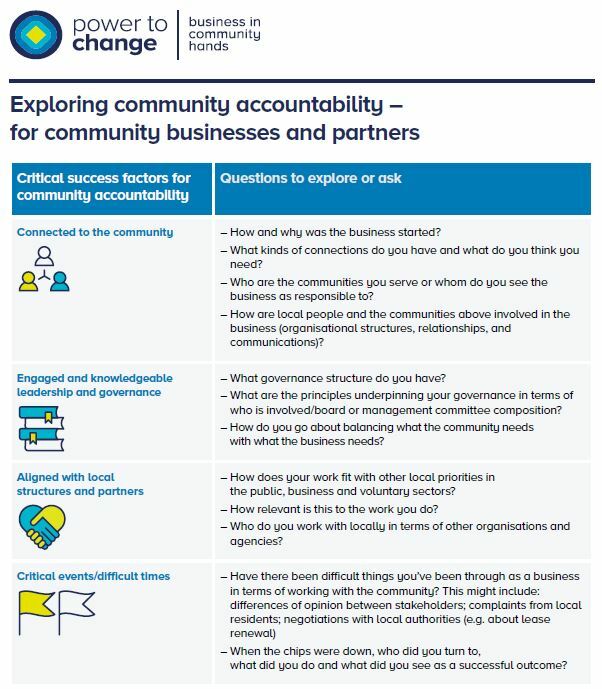 The community businesses studied all emphasised the value, for the financial sustainability, of community goodwill and community buy-in, and the role that community accountability played in that. A good illustration of the value of being embedded in and accountable to the local community was when the businesses talked about times of crisis, and how at those times their embeddedness in the local community had both shaped how they responded, and given them the buffer they needed to survive. When thinking about a time when the business was in crisis, and how the community was involved, made the concept of ‘accountability’ much more tangible. For example, the concept of a succession business, where the community come together to rescue a local a business facing closure or ownership-succession problems, sometimes ensuring a community provides the capital for a community business serving a community’s interests. Here, ownership and investment can go together to create a formal accountability structure, ensuring capital provided by the community can be more aligned, patient and – potentially – forgiving in a time of crisis. Critical events or difficult times can be useful markers for helping businesses to reflect on processes that might otherwise feel intangible and like common sense (i.e. ‘just our way of working’). So far, so good – all of the above is what we might have expected to find. So what? And, what next? The research suggests that the way forward – for funders like Power to Change – is to focus not on formalising everything but on supporting organisations to articulate the many ways that they live their values in relation to being of, from and/or for their communities. A set of questions have been developed, to help funders to interrogate an organisation’s embeddedness in its local community, and to help community businesses to self-evaluate and to better articulate how they work. We will be using these questions as we go into 2018, to help us to make better funding and support decisions. And, having reflected on the findings of this research, we want to start a discussion about what good looks like in community accountability. Get in touch if you want to contribute to that debate. We want to work with community businesses to develop a shared sense of what good practice looks like, and understand how we can all stretch ourselves to be truly accountable, responsive, embedded – whatever we choose to call it.